MEGA64 SOUNDTRACK DOUBLE LP TRACKLISTING!! Tonight is the night! 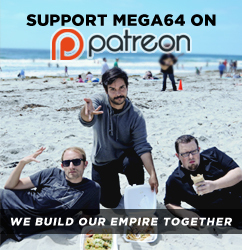 The biggest item of our Thanksgiving weekend merch explosion, Mega64 The Soundtrack 15th Anniversary Complete Edition, goes up for preorder. We thought we'd take a moment to reveal the final tracklisting for the album. Here's what you'll find on each side of this double vinyl record LP (and via digital download with the package!). Be sure to be there tonight (following the end of the Mega64 Podcast Live) to get your preorder in and secure your copy of this most special package!